Background: The treatment of obesity is challenging, and its management is often intensive and requires significant professional commitments. A core principle of behavioral interventions for obesity is self-monitoring, often with a focus on counting calories and monitoring body weight. Objectives: The objectives of this study were to to investigate the effectiveness of weight loss intervention and to assess its effects on wight and some metabolic parameters among obese female attending outpatient clinic at king Fahad Medical city, Riyadh, KSA. Materials and Methods: Morbidly obese females (n = 104) from an outpatient obesity clinic at King Fahad Medical City, Riyadh, Saudi Arabia took part in the intervention for 3 months and were assessed at baseline and post-treatment. Blood glucose homeostasis and lipid parameters were measured in addition to body characteristics, attitudes toward foods, and intervention commitment. The data were analyzed using the IBM SPSS Statistics for Windows, Version 20.0. Results: A total of 97 morbidly obese females completed the study. Participants achieved moderate body weight (−7.8%) and fat loss (−5.5%); study commitment was strongly associated with body mass index change (rho = −0.703, P < 0.001). Glucose homeostasis improved significantly as follows: hemoglobin A1c level improved by −7.5%, fasting glucose by −7.3%, and Homeostasis Model Assessment insulin sensitivity and insulin resistance improved by about 16%. Blood lipids improved significantly as follows: triglycerides level improved by −14%, low-density lipoproteins by −8%, total cholesterol by −6%, and high-density lipoproteins by +5%. Blood health parameters were significantly associated with distinct commitment to behaviors suggesting improvements in diet. Conclusion: The intervention based on self-monitoring of eating behaviors was effective in achieving moderate weight loss, lead to improvements in blood health-risk markers related to metabolic and cardiovascular disease, and improved food attitudes. Obesity has reached pandemic proportions; in 2014, 52% of the assessed global population was overweight or obese on the basis of their body mass index (BMI). Traditional dietary interventions with or without exercise have shown varying degrees of short- and long-term effectiveness. There is a pressing need for weight loss interventions that are less intensive and less demanding in terms of delivery hours and staffing, and which participants themselves can perform more independently. Self-monitoring is often utilized as the main component in weight-loss interventions, with caloric intake and body weight being the parameters most frequently selected for monitoring. Such interventions have produced clinically meaningful weight loss (e.g., >5%). However, self-monitoring interventions might be more successful if various levels of eating behavior were included in the monitoring process rather than body weight and caloric intake alone. The study objectives were (a) to investigate the effectiveness of the intervention and (b) to monitor improvements in participants’ metabolic health-risk factors in blood samples, which are known to respond to improvements in the quality of diet and weight loss. After ethical approval had been granted by the Saudi Ministry of Health and Institutional Review Board at King Fahad Medical City, Riyadh, Saudi Arabia (Application No. H-01-R-012), and departmental ethics committee, Bangor University, UK, obese females were recruited from an obesity outpatient clinic at King Fahad Medical City, Riyadh, Saudi Arabia (September 2012 to July 2013). Participants were between 18 and 60 years of age, had a BMI ≥30, had not been diagnosed with any acute or chronic medical condition, and were not taking any prescribed medication except for statins and contraceptives. In addition, they were required not to have lost more than 5% of their body weight during the previous 6 months and not to be participating in any other weight loss or dieting program. After informed consent had been obtained, participants took part in the 3 months intervention. A baseline and post-intervention assessment was completed, which included questionnaires, measures of body characteristics, and blood samples taken at a laboratory at the medical center. Additionally, participants were weighed monthly, and their written commitment reports (described in the “Intervention” section) were collected during the weighing sessions. All intervention materials were provided in Arabic, and the intervention was conducted in Arabic. A trained nurse at King Fahad Medical City, Riyadh, administered all of the assessments. The design of the intervention was based on behavioral theories, in particular the goal conflict model and control theory. The intervention tools were developed to utilize selected behavior-change techniques. These included the participants’ self-monitoring and self-evaluation of their behavior, goal setting, a prompt review of their behavioral goals, information about the consequences of their behavior, and feedback about their performance. A repetitive structure of self-evaluation, self-monitoring, and prior planning was also used to facilitate participants’ self-regulation and better adherence to their dieting goals. Ten target behaviors were selected for the intervention, which were extracted from the recent scientific literature, as judged to be highly important for weight loss and health. Key references for the importance of these behaviors for health and weight control are shown in [Table 1].,,,,,,,,,,,,,,,,,,,,,,,,,Moreover, the selections were based on their practicability for being easily implemented through self-monitored behaviors. They were then incorporated into a set of behavioral commandments [Table 1]. To enable participants to practice the target behaviors, the intervention utilized the following three main tools: (a) an information leaflet, (b) a prompt card, and (c) a commitment report form. The aim of the information leaflet was to increase the participants’ knowledge and understanding of the health benefits and risks of the target behavior that underlay each eating commandment. The prompt card included short, slogan-like versions of the behavioral commandments from the leaflet and examples of choices that the participant could make. In particular, the prompt card facilitated (a) the analysis of recent eating behavior in a reflective manner and (b) monitoring commitment to the commandments at the end of each day. Daily commitment analyses were performed with the help of the commitment report, the prompt card, and the information leaflet. For the analysis, participants were asked to focus on the behaviors that the commandments targeted and to evaluate whether they had succeeded or failed in their commitment to each commandment. If they had succeeded, they were then asked to think about why they had done so; if they had failed, they were asked to consider the barriers that had prevented them from achieving their commitment that day. The participant then made a plan for how to increase commitment on the next day in the face of the challenges from the previous day, and a new set of commandments was selected as the goal for the next day. Each month, participants brought their commitment reports to the weighing sessions, during which their successes were praised, and further commitments were encouraged. The instructions and training for the intervention were conducted using a PowerPoint presentation to help participants understand the tools that they would use and how they should perform the self-monitoring and evaluation of their eating behaviors. The intervention had been previously piloted in a university setting with obese females (n = 37) who achieved moderate weight loss. Participants’ height was measured using a wall-mounted stadiometer (Bodycare Products, Southam, UK). A digital scale (Seca; Vogel & Halke, Hamburg, Germany) was used to measure body weight, and body composition was measured via bio-impedance analysis (InBody 230, Biospace Co., Ltd, South Korea). Participants were weighed in a nonfasting state while they wore minimal, lightweight clothing. Waist circumference was measured using a tape measure at the minimum circumference between the iliac crest and the rib cage. An adapted version of the Explicit Attitudes Questionnaire was used to measure participants’ explicit attitudes toward healthy and unhealthy foods. It assesses explicit attitudes toward (a) low-fat, low-sugar, high-fiber foods, which are categorized as healthy, and (b) high-fat, high-sugar, low-fiber foods, which are categorized as unhealthy. The questionnaire measures the eight dimensions of respondents’ attitude about food (e.g., enjoyable/not enjoyable, good/bad): “For me, eating un/healthy food is ….” The scale on which respondents indicated their ratings ranged from 1 (extremely) through 4 (neither) to 7 (extremely). Higher scores indicate a more positive explicit attitude about healthy or unhealthy foods. Each day, participants filled out a commitment report by indicating which behaviors they had and had not been committed to that day. The commitment sheets covered a time span of 14 days. Completed reports were collected during the monthly weighing sessions. Blood samples were taken by venipuncture between 7:00 AM and 9:00 AM after 12 h of overnight fasting. The levels of glucose, total cholesterol (TC), triglycerides (TG), low-density lipoproteins (LDL), high-density lipoproteins (HDL), and hemoglobin A1c (HbA1c) were measured on a Siemens Dimension RXL Max using a VITRO FLEX REAGENT CARTRIDGE KIT (Siemens Healthcare Diagnostic Ltd, UK). Each blood sample was measured in triplicate. Plasma insulin level was measured by enzyme immunoassay using human insulin ELISA kit (Q-1-Diaplus, USA). Insulin sensitivity was determined by Homeostasis Model Assessment (HOMA2) based on fasting glucose and insulin concentrations. The HOMA2 model is available at www.ocdem.ox.ac.uk. Measures were performed in the certified clinical laboratory at King Fahad Medical City, Riyadh, Saudi Arabia. The data were analyzed using the IBM SPSS Statistics for Windows, Version 20.0. Armonk, NY: IBM Corp., USA. Descriptive statistics [means and standard deviations (SDs)] for all of the study variables were calculated. One-way repeated measures analysis of variances or t-tests were run to evaluate changes in the study parameters across time. Follow-up t-tests between the baseline and post-intervention were conducted. 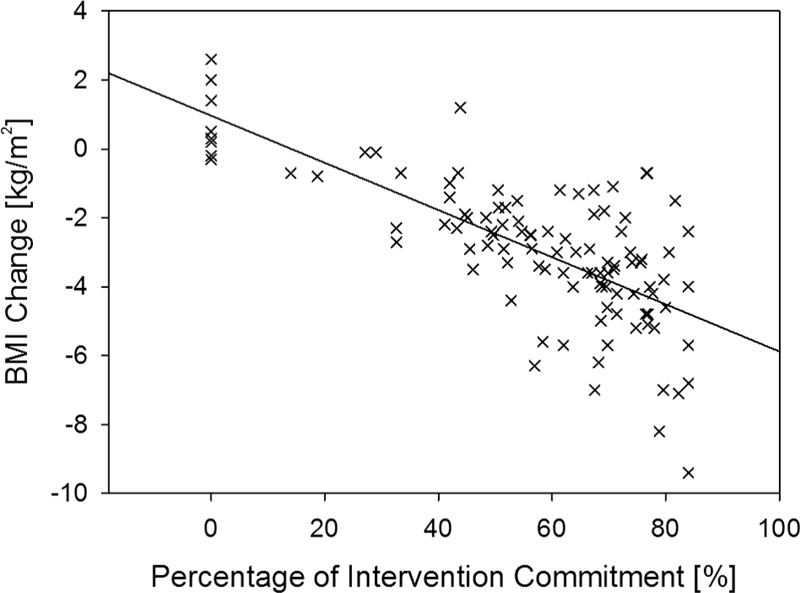 Participants who withdrew from the intervention were included, but their commitment levels were set zero. All of the participants who withdrew from the study did so within the first 2 weeks, and none of them had submitted a report of their commitments. Pearson correlations or Spearman’s rho coefficients among the study variables were calculated depending on whether the data met the assumptions of the statistical test. Significance was set at P < 0.05. Morbidly obese females (n = 104) enrolled for the 3-month intervention, and 96 of them completed it. The body characteristics of the participants who withdrew from the intervention were included in the analysis because these participants agreed to complete the post-intervention assessment, thus enabling us to conduct an intention-to-treat (ITT) analysis. For the duration of the intervention, the mean commitment to the various commandments of participants who completed the intervention was 69% (±17.3%). Their highest commitment (79%) was to Commandment B6 (reduction in salt intake), and their lowest commitment (64%) was to Commandment B2 (fiber intake) [Table 2]. Participants achieved a moderate loss of body weight (−7.8%) and body fat (−5.5%). Their other body characteristics also improved significantly [Table 3]. The ITT analysis confirmed that the reduction in body weight was moderate (−7%) [Table 3]. The analysis of the relationships between participants’ mean commitment to the behavioral commandments and reductions in their BMI and body weight consistently showed strong negative correlations; Spearman’s rho = −0.689, P < 0.001 for body weight and −0.703, P < 0.001 for BMI [Figure 1]. This suggests that participants’ commitment to the intervention was a critical determinant of their ability to reduce their body weight. 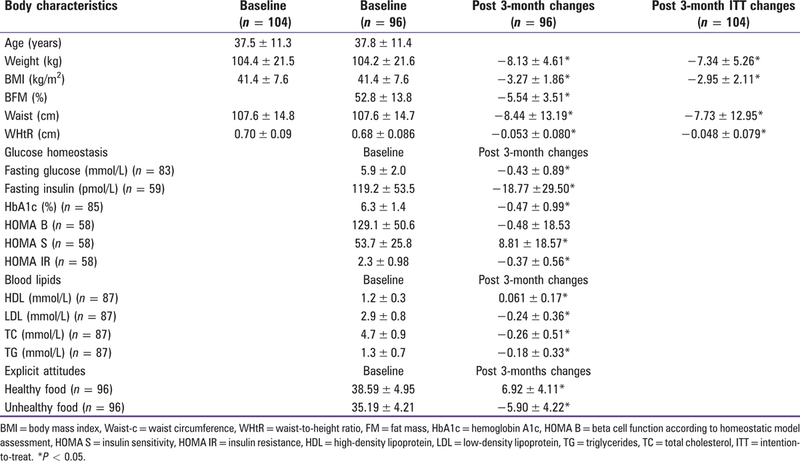 Fasting blood parameters related to glucose homeostasis [Table 3] revealed that after the 3-month intervention, HbA1c (−7.5%) and fasting glucose (−7.3%) levels had decreased to the extent that they were no longer at prediabetic levels. Fasting insulin, insulin sensitivity, and insulin resistance values (except for beta cell function) showed a significant improvement of about 16%. There were also significant associations between participants’ commitment to the commandment related to sugar intake (B1) and improvements in their fasting glucose level (Spearman’s rho = −0.468, P < 0.001) and HbA1c level (Spearman’s rho = −0.366, P = 0.001). Moreover, there were significant associations between commitment to the commandment related to liquid calorie intake (B10) and participants’ fasting glucose level (Spearman’s rho = −0.479, P < 0.001) and their HbA1c level (Spearman’s rho = −0.418, P < 0.001). However, associations between fasting glucose and HbA1c and mean commitment across all target behaviors were lower, with Spearman’s rho = −0.368, P = 0.001 and Spearman’s rho = −0.282, P = 0.008, respectively. Blood-lipid parameters had improved significantly by the end of the 3-month intervention; TG had decreased by 14%, LDL by 8%, and TC by 6%, and HDL had increased by 5% [Table 3]. The strongest relationships between a behavioral commitment and blood lipid parameters were between meat intake (B4) and LDL (Spearman’s rho = −0.503, P < 0.001), TC (Spearman’s rho = −0.544, P < 0.001), and TG (Spearman’s rho = −0.421, P < 0.001). Mean commitment across all behaviors was correlated with reductions in LDL (Spearman’s rho = −0.329, P = 0.002), TC (Spearman’s rho = −0.383, P < 0.001), and TG (Spearman’s rho = −0.326, P = 0.002). With regard to participants’ explicit attitudes toward healthy and unhealthy foods, there was a significant reduction in their positive attitudes toward unhealthy food (−17%) and an increase in their positive attitudes toward healthy food (+18%; [Table 3]). The improvements in explicit attitudes were correlated with mean commitment to the commandments. Specifically, commitment was positively correlated with changes in attitudes about healthy foods (Spearman’s rho = 0.312, P = 0.001) and negatively correlated with changes in attitudes about unhealthy foods (Spearman’s rho = −0.403, P < 0.001). Overall, participants who reported the strongest commitment to the intervention commandments achieved the largest improvements in explicit attitudes. In this study, morbidly obese female participants had achieved a 6–7% loss in body weight after 3 months. This amounts to more than 1.5 kg loss in body weight per month. Self-monitoring interventions using weight or dietary intake for monitoring practice have achieved clinically meaningful weight loss; however, the weight loss was often less and not sustained. In our study, there was a strong association between reported commitment to target behaviors and reductions in body weight and BMI. Indeed, associations between successful self-monitoring and weight loss have frequently been reported; however, the association has usually ranged from low to moderate. Having an intention to achieve a goal, or even becoming committed to achieving a particular goal, does not of course guarantee that the goal will be achieved. Indeed, the monitoring of goal progress is essential for goal achievement; in fact, the frequency of monitoring is an important mediator of goal attainment. Self-monitoring includes individuals’ deliberate attention to certain aspects of their behavior and their concurrent recording of it. Although many studies have used the monitoring of targeted outcomes (e.g., weight loss), in the present intervention, participants self-monitored their target behaviors that were thought to mediate successful outcomes. Participants performed the self-monitoring exercises and filled in commitment reports on a daily basis. However, they not only monitored their eating behavior, but also evaluated their goal attainments (i.e., commitments to the eating behavioral commandments). Consequently, in accordance with control theory, they judged the discrepancy between goals that they had set and their attainment of them, thus enabling them to review and revise their goals on the basis of their actual achievements. Indeed, self-regulation theory posits that self-monitoring precedes the evaluation of goal attainment, and it enables individuals to reinforce themselves for progress that they have made. Likewise, monitoring goal progress has been shown to have a large effect on goal attainments. The present study was designed so that participants recorded their day-to-day goal attainments across 14-day periods. Thus, they were able to continually monitor their progress toward achieving their goals. In addition, it has been repeatedly shown that goal attainments are more successful if the goals are closely linked to the parameters that are being monitored. In the present intervention, progress toward achieving the behavioral goals was monitored and evaluated according to the specified targets. Goal attainment was defined as commitment to the various commandments rather than to weight loss. Weight loss, therefore, was only indirectly linked to the parameters that were being monitored. In the present study, behavioral goals were condensed into a slogan-like structure to ease the process of monitoring and their evaluation. In fact, using abbreviated checklists for self-monitoring has been shown to lead to higher rates of the completion of goal diaries. Attitudes are a strong predictor of future behavior. Hearty et al. found that attitudes toward healthy food were linked to both actual eating behavior and BMI. Strong relationships between attitudes and food choices have been reported in several studies., Indeed, participants’ explicit attitudes toward healthy foods increased; it decreased toward unhealthy foods. One of the major aims of weight-reduction interventions is to reduce health-risk factors related to obesity; obesity is a causative factor in chronic diseases such as cardiovascular disease, metabolic syndrome, and Type 2 diabetes. This study measured metabolic risk factors related to glucose and lipid homeostasis and to participants’ body characteristics. The intervention substantially improved glycemic control parameters. Fasting glucose and HbA1c levels, which is the most important measure of long-term glycemic control, were reduced from prediabetic levels toward the normal range. According to the American Heart Association, the American College of Cardiology, and the Obesity Society Guidelines for the Management of Overweight and Obesity, in overweight and obese adults with Type 2 diabetes, a 2–5% weight loss can result in lowering HbA1c by 0.2–0.3%, and a weight loss of 5–10% is associated with HbA1c reductions of 0.6–1.0%. Interestingly, in the present study, changes in HbA1c level seem not to have been caused solely by weight loss; there was no correlation between weight loss and HbA1c. The association between positive alterations in glucose homeostasis parameters and commitment to reducing sugar intake and liquid caloric intake suggests that improvements in participants’ diet contributed to the positive outcomes in addition to weight loss. Alterations in HbA1c levels are known to be sensitive to longer-term diet changes even without weight loss. The additional markers of glycemic control, such as insulin and fasting glucose levels, have been effectively altered by low-carbohydrate and low-fat diets, and this was to the same degree that was achieved in the present study. Beneficial alterations in lipid profiles are often associated with weight loss. However, in the present study, participants’ commitment both to the intervention in general and to particular individual commandments (reduction in meat consumption and calorie-dense foods) were correlated with beneficial alterations in the lipid profiles. This suggests that commitment to the intervention reflected alterations in participants’ diet in terms of both reduced caloric intake and the quality of the diet. In fact, it is well known that improvements can occur in the lipid profile as a result of dietary interventions (e.g., low carbohydrate and low-fat diets). In conclusion, the intervention evaluated in this research was based on the participants’ self-monitoring of their eating behavior. Participants undergoing the intervention achieved moderate weight loss, improved their explicit attitudes toward food, and improved their metabolic health-risk blood parameters. The intervention requires less professional time from healthcare providers than other weight-loss programs with similar effectiveness. It should, therefore, be cost-effective. Future studies to evaluate this possibility are needed. We thank the staff of the obesity clinic at King Fahad Medical City, Saudi Arabia, for supporting our study. Franz MJ, Vanwormer JJ, Crain AL, Boucher JL, Histon T, Caplan W et al. Weight-loss outcomes: A systematic review and meta-analysis of weight-loss clinical trials with a minimum 1-year follow-up. J Am Diet Assoc 2007;107:1755-67. Burke LE, Wang J, Sevick MA. Self-monitoring in weight loss: A systematic review of the literature. J Am Diet Assoc 2011;111:92-102. Jensen MD, Ryan DH, Apovian CM, Ard JD, Comuzzie AG, Donato KA et al. 2013 AHA/ACC/TOS guideline for the management of overweight and obesity in adults: A report of the american college of cardiology/american heart association task force on practice guidelines and the obesity society. J Am Coll Cardiol 2014;63:2985-3025. Stroebe W, Mensink W, Aarts H, Schut H, Kruglanski AW. Why dieters fail: Testing the goal conflict model of eating. J Exp Soc Psychol 2008;44:26-36. Carver CS, Scheier MF. Control theory: A useful conceptual framework for personality-social, clinical, and health psychology. Psychol Bull 1982;92:111-135. Michie S, Ashford S, Sniehotta FF, Dombrowski SU, Bishop A, French DP. A refined taxonomy of behaviour change techniques to help people change their physical activity and healthy eating behaviours: The CALO-RE taxonomy. Psychol Health 2011;26:1479-98. Malik VS, Popkin BM, Bray GA, Despres JP, Willett WC, Hu FB. Sugar-sweetened beverages and risk of metabolic syndrome and Type 2 diabetes. Diabetes Care 2010;33:2477-83. Malik VS, Pan A, Willett WC, Hu FB. Sugar-sweetened beverages and weight gain in children and adults: A systematic review and meta-analysis. Am J Clin Nutr 2013;98:1084-102. Te Morenga LA, Mann J, Mallard S. Dietary sugars and body weight: Systematic review and meta-analyses of randomised controlled trials. FASEB J 2013;27: Suppl. 622.17. Lock K, Pomerleau J, Causer L, Altmann DR, McKee M. The global burden of disease attributable to low consumption of fruit and vegetables: Implications for the global strategy on diet. Bull World Health Organ 2005;83:100-8. Boeing H, Bechthold A, Bub A, Ellinger S, Haller D, Kroke A et al. Critical review: Vegetables and fruit in the prevention of chronic diseases. Eur J Nutr 2012;51:637-63. Wang X, Ouyang YY, Liu J, Zhu MM, Zhao G, Bao W et al. Fruit and vegetable consumption and mortality from all causes, cardiovascular disease, and cancer: Systematic review and dose-response meta-analysis of prospective cohort studies. Br Med J 2014;349:g4490. Salmeron J, Ascherio A, Rimm EB, Colditz GA, Spiegelman D, Jenkins DJ et al. Dietary fiber, glycemic load, and risk of NIDDM in men. Diabetes Care 1997;20:545-50. Chandalia M, Garg A, Lutjohann D, von Bergmann K, Grundy SM, Brinkley LJ. Beneficial effects of high dietary fiber intake in patients with Type 2 diabetes mellitus. N Engl J Med 2000;342:1392-8. Slavin JL. Dietary fiber and body weight. Nutrition 2005;21:411-8.
van Dam RM, Stampfer M, Willett WC, Hu FB, Rimm EB. Dietary fat and meat intake in relation to risk of Type 2 diabetes in men. Diabetes Care 2002;25:417-24. Aune D, Ursin G, Veierod MB. Meat consumption and the risk of Type 2 diabetes: A systematic review and meta-analysis of cohort studies. Diabetologia 2009;52:2277-87. Chan DS, Lau R, Aune D, Vieira R, Greenwood DC, Kampman E et al. Red and processed meat and colorectal cancer incidence: Meta-analysis of prospective studies. Plos One 2011;6:e20456. Prentice AM, Jebb SA. Fast foods, energy density and obesity: A possible mechanistic link. Obes Rev 2003;4:187-94. Ello-Martin JA, Ledikwe JH, Rolls BJ. The influence of food portion size and energy density on energy intake: Implications for weight management. Am J Clin Nutr 2005;82:236S-41S. Astrup A, Grunwald GK, Melanson EL, Saris WH, Hill JO. The role of low-fat diets in body weight control: A meta-analysis of ad libitum dietary intervention studies. Int J Obes 2000;24:1545-52. He JA, Ogden LG, Vupputuri S, Bazzano LA, Loria C, Whelton PK. Dietary sodium intake and subsequent risk of cardiovascular disease in overweight adults. JAMA 1999;282:2027-34. He FJ, MacGregor GA. Salt intake and cardiovascular disease. Nephrol Dial Transplant 2008;23:3382-4. Grimes CA, Wright JD, Liu K, Nowson CA, Loria CM. Dietary sodium intake is associated with total fluid and sugar-sweetened beverage consumption in US children and adolescents aged 2–18 y: NHANES 2005-2008. Am J Clin Nutr 2013;98:189-96. Robinson TN. Reducing children’s television viewing to prevent obesity: A randomized controlled trial. JAMA 1999;282:1561-7. Crespo CJ, Smit E, Troiano RP, Bartlett SJ, Macera CA, Andersen RE. Television watching, energy intake, and obesity in US children: Results from the third National Health and Nutrition Examination Survey, 1988–1994. Arch Pediatr Adolesc Med 2001;155:360-5. Wansink B, Sobal J. Mindless eating: The 200 daily food decisions we overlook. Environ Behav 2007;39:106-23. Ma YS, Bertone ER, Stanek EJ, Reed GW, Hebert JR, Cohen NL et al. Association between eating patterns and obesity in a free-living US adult population. Am J Epidemiol 2003;158:85-92. Phillips SM, Bandini LG, Naumova EN, Cyr H, Colclough S, Dietz WH et al. Energy-dense snack food intake in adolescence: Longitudinal relationship to weight and fatness. Obes Res 2004;12:461-72. Rampersaud GC, Pereira MA, Girard BL, Adams J, Metzl JD. Breakfast habits, nutritional status, body weight, and academic performance in children and adolescents. J Am Diet Assoc 2005;105:743-60. Lichtman SW, Pisarska K, Berman ER, Pestone M, Dowling H, Offenbacher E et al. Discrepancy between self-reported and actual caloric intake and exercise in obese subjects. N Engl J Med 1992;327:1893-8. Krukowski RA, Harvey-Berino J, Kolodinsky J, Narsana RT, DeSisto TP. Consumers may not use or understand calorie labeling in restaurants. J Am Diet Assoc 2006;106:917-20. Bleich SN, Pollack KM. The publics’ understanding of daily caloric recommendations and their perceptions of calorie posting in chain restaurants. BMC Public Health 2010;10:121. DiMeglio DP, Mattes RD. Liquid versus solid carbohydrate: Effects on food intake and body weight. Int J Obes 2000;24:794-800. Ludwig DS, Peterson KE, Gortmaker SL. Relation between consumption of sugar-sweetened drinks and childhood obesity: A prospective, observational analysis. Lancet 2001;357:505-8. Courneya KS, Bobick TM. Integrating the theory of planned behavior with the processes and stages of change in the exercise domain. Psychol Sport Exerc 2000;1:41-56. Gollwitzer PM, Sheeran P. Implementation intentions and goal achievement: A meta-analysis of effects and processes. Adv Exp Soc Psychol 2006;38:69-119. Helsel DL, Jakicic JM, Otto AD. Comparison of techniques for self-monitoring eating and exercise behaviors on weight loss in a correspondence-based intervention. J Am Diet Assoc 2007;107:1807-10. Kanfer R. A theory of goal-setting and task-performance. Contemp Psychol 1991;36:847-8. Harkin B, Webb TL, Chang BP, Prestwich A, Conner M, Kellar I et al. Does monitoring goal progress promote goal attainment? A meta-analysis of the experimental evidence. Psychol Bull 2016;142:198-229. Freund AM, Hennecke M. Changing eating behaviour vs. losing weight: The role of goal focus for weight loss in overweight women. Psychol Health 2012;27:25-42. Kraus SJ. Attitudes and the prediction of behavior: A meta-analysis of the empirical literature. Pers Soc Psychol Bull 1995;21:58–75. Hearty AP, McCarthy SN, Kearney JM, Gibney MJ. Relationship between attitudes towards healthy eating and dietary behaviour, lifestyle and demographic factors in a representative sample of Irish adults. Appetite 2007;48:1-11.
deGraaf C, VanderGaag M, Kafatos A, Lennernas M, Kearney JM. Stages of dietary change among nationally-representative samples of adults in the European Union. Eur J Clin Nutr 1997;51:S47-56. Paisley C, Lloyd H, Sparks P, Mela DJ. Consumer perceptions of dietary changes for reducing fat intake. Nutr Res 1995;15:1755-66. Grundy SM. Obesity, metabolic syndrome, and cardiovascular disease. J Clin Endocrinol Metab 2004;89:2595-600. Itsiopoulos C, Brazionis L, Kaimakamis M, Cameron M, Best JD, O’Dea K et al. Can the Mediterranean diet lower HbA1c in Type 2 diabetes? Results from a randomized cross-over study. Nutr Metab Cardiovasc Dis 2011;21:740-7. Nordmann AJ, Nordmann A, Briel M, Keller U, Yancy WS, Brehm BJ et al. Effects of low-carbohydrate vs low-fat diets on weight loss and cardiovascular risk factors: A meta-analysis of randomized controlled trials. Arch Intern Med 2006;166:285-93. Lemon SC, Rosal MC, Zapka J, Borg A, Andersen V. Contributions of weight perceptions to weight loss attempts: Differences by body mass index and gender. Body Image 2009;6:90-6. Flechtner-Mors M, Ditschuneit HH, Johnson TD, Suchard MA, Adler G. Metabolic and weight loss effects of long-term dietary intervention in obese patients: Four-year results. Obes Res 2000;8:399–402.